Archos has just announced the Archos TV connect compromised of a touch remote and an Android 4.1 Jelly Bean set-top box and that be placed on to top of your TV. The Android 4.1 media player is powered by a multi-core 1.5GHz processor with 1 GB RAM and 8GB flash. The touch remote allows you to control your TV just like a tablet with tap, swipe, zoom in, zoom out, select or type. Misc – LED notification (for incoming calls), Microphone. The package comes with ARCHOS TV connect, the TV Touch remote, a power supply, an HDMI cable and a user guide. 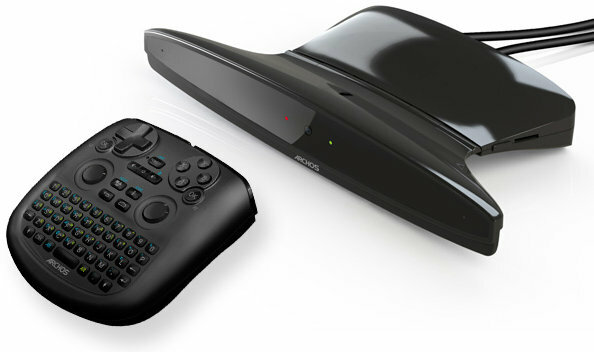 The functionality is very similar to what you would get with an Android mini PC and a Fly Mouse, but Archos TV connect adds an Ethernet port (a must for high bitrate videos), an HD camera (useful for Skype / Google Talk video calls) and it has been designed to neatly fit on top of your TV. The device comes with ARCHOS Media Center applications which should made it pretty good to manage and play your video files. Pointer – Allows you to control your TV just like you would your tablet with a tapping and/or swiping motion. Full multi-touch gesture support – Control your apps easily with zoom In, zoom out and rotate. It’s also compatible with Archos Gaming Mapping Tool used with the Gamepad that allows you to define the buttons used for a particular game. The device should be available in February 2013 for $129 / 129 Euros / 99 GBP. You can get further information on Archos TV Connect page.